Shares in the UK's biggest technology firm, Micro Focus International, have plunged after it warned of a sharper than expected fall in revenues and its chief executive resigned. Shares in the company, whose customers include BMW and American Express, were down 42% in afternoon trading. The problems stem from its purchase of Hewlett Packard Enterprise's software business for £6.8bn. Difficulties in integrating the business have hit revenues. At one point on Monday, shares in Micro Focus - which is a member of the FTSE 100 share index of leading UK-listed companies - had fallen 56%. Micro Focus specialises in extending the life of clients' older IT systems, saving them from having to buy new systems. Its purchase of Hewlett Packard Enterprise saw it take over another former British computer business, Autonomy, which itself had been taken over by HP. The company, whose headquarters are in Newbury, Berkshire, was founded in 1976. 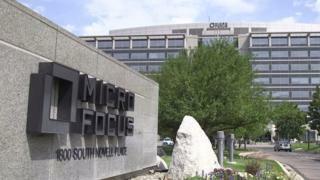 Micro Focus's executive chairman, Kevin Loosemore, said operational issues had led to a "disappointing short-term performance" but that he remained confident in the firm's strategy. Mr Loosemore told the Reuters news agency: "We're finding the integration harder than we'd anticipated or planned. "[We have] no regrets... but the returns clearly may be delayed slightly." Micro Focus said chief executive Chris Hsu was leaving "in order to spend more time with his family and pursue another opportunity". He will be replaced by chief operating officer Stephen Murdoch. The company's statement added that its cost savings drive was ahead of schedule and its net debt was expected to be in line with expectations.